Colin Tizzard registered a 4334/1 treble on day two, Ladies Day, of the 2017 Randox Health Grand National Festival, after Ultragold ran out a game 50/1 winner under 18-year-old Harry Cobden. Always travelling well for Cobden, having his first ride over the Grand National fences, the nine-year-old son of Kapgarde disputed the lead approaching the home turn and after winging the last, kept on resolutely to fend off the challenge of Joseph O'Brien's Katnap 22/1, who was a length behind in second. 66/1 shot Portrait King, trained by Patrick Griffin, was six-lengths behind in third with Nicky Henderson's O O Seven (12/1), a neck further back in fourth. A delighted Tizzard said: "It's amazing to win a race like this. His owners [Brocade Racing, P Romans and Terry Warner] are all good owners of ours and got a partnership going. "He cost a pound or two and whilst he has won six races, he wasn't what we thought we were buying. "We thought we were buying a three mile and two furlong horse but he is really a two mile or two and a half-mile horse, but he has won a lovely race today. This racing game is amazing." Tizzard was also effusive in his praise of Cobden: "He hunted alongside me as a little boy for a long time and I was just thinking three out, just sit still but I didn't have to say it because he did. "He has got a brain on him and I bet he enjoyed this. His mum and dad will have as well." Tizzard had earlier tasted victory at Aintree with Pingshou (G1 Crabbie's Top Novices Hurdle) and Fox Norton (G1 JLT Melling Chase). Jockey Danny Mullins was close to making his first ride over the National fences a winning one but the Joseph O'Brien-trained Katnap couldn't quite reel in the winner, Ultragold. The 22/1 shot jumped well in the main for the young jockey but his pilot felt that a slight mistake at the fourth last fence put paid to his chances. "He's given me a great spin," said Mullins. "He's just missed the fourth last out I think - the ditch - and it was probably the difference between winning and losing. "Joseph has got him here in great shape and he's run well. "He could be the type to come back here and run another big race next season - he certainly loved the fences." Jockey Nico De Boinville finished fourth on the Nicky Henderson-trained O O Seven and revealed after the race that the 12/1 shot took to the Aintree fences like a duck to water. 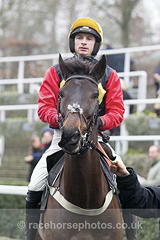 "He was brilliant - I couldn't have had a better spin round there," said De Boinville. "He absolutely loved these fences so I'd imagine he'll definitely be back and who knows what he could do next time." Racehorses owners Douglas Pryde and Jim Beaumont, successful in the 2013 Randox Health Grand National with 66/1 winner Auroras Encore, are compiling a growing list of good results at Aintree. They embellished it further when their horse Portrait King finished third in the Randox Health Topham Chase. The grey 12-year-old, ridden by Conor O'Farrell was 7lb out of the handicap and started at 66/1, but he steadily passed horses in the straight and finished one length and six lengths behind winner Ultragold and runner-up Katnap. Trainer Pat Griffin, who is based in Ireland, "doesn't do boats" according to his son James, who acted as his representative at Aintree today. James added: "We knew the trip [for Portrait King] would be too short, but Conor gave him a peach of a ride. He was told to hunt away, because we knew the fences would take their toll on others, and he likes the track and would tick that box. Hopefully, he will go up a couple of pounds for today's effort and that will help him get into the Becher Chase [at Aintree] in December. "He was sixth in it last year and fell when looking like he might have won it the year before. He just loves this place and is probably a 7lb to 10lb better horse here than anywhere else. We knew he wouldn't get into the National, so didn't even put him in it, but Jim and Douglas love Aintree and we've got a soft spot for the place, too. "Softer ground would have helped, but that was a hell of a kick." Pryde and Beaumont won the race before the Randox Health Grand National with 50/1 shot Maggio last year, but that Griffin-trained horse was withdrawn from the big race on Monday with a minor injury. Pryde said: "We just love this place and it seems to love us - we've been coming for many years," while Beaumont said: "The secret is to get a horse that suits Aintree and to keep it fresh for the meeting." O'Farrell was asked about his ride on Portrait King and said: "It went very fast. I was out the back the whole way because he just lacks a gear, but he jumped superbly and I had a great spin off him. I knew from the Melling Road I had only been going through the motions and just popping away, but when I asked him he picked up really well."